The producers of the burlesque show will open the full entertainment venue Uptown Underground this fall. UPTOWN— Tickets are now on sale for a week's worth of events celebrating Uptown Underground's grand opening. The much-anticipated Uptown Underground, located in the basement of the Uptown Broadway Building at 4707 N. Broadway, will celebrate its grand opening with performances scheduled every night from Dec. 31 through Jan. 4. The theater was founded by the producers of Chicago-based burlesque troupe Kiss Kiss Cabaret, Chris O. Biddle and Jenn Kincaid. Kiss Kiss Cabaret will celebrate New Year's Eve in typical fashion, with their annual New Year's Eve Hullabaloo, which kicks off at 9 p.m. Tickets range from $50 to $125. On Jan 1., a cast of "Chicago's finest magicians" will take the stage at 8 p.m. for a night of magic. 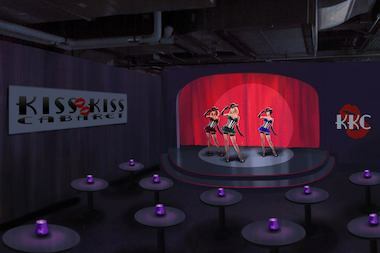 The ladies of Kiss Kiss Cabaret will break in their new stage on Jan. 2 and Jan 3. with a classic burlesque show. The grand opening week will close out on Jan. 4 with "The Bees Knees Bazaar," a "veritable variety of everything to come." The open house-style evening will feature a number of Uptown Underground companies and pop-up performances. Tickets for all five nights are on sale at uptownunderground.net.